I cycled along the long straight lane from Haughley, over the top of the Haughley Park estate, and arrived in the pretty village of Wetherden. As many times before, I was struck by its spectacular exterior, especially the south aisle. Mortlock describes it as 'lavish', and the word is exactly right. It was built in the middle of the 15th century by Sir John Sulyard, and completed by his widow's second husband Sir Thomas Bourchier. The Sulyards were a prominent Suffolk family, who later became recusants. They intermarried with the Garneys, who we have met at Kenton and Redlingfield. Sir John was Chief Justice to Richard II, which may be why the family didn't respond too well to the whims and fancies of the Tudors. The most striking feature of the exterior on the south aisle is the series of shields and symbols cut into the buttresses and the base course. The most famous of these is the Annunciation lily cut into the buttress immediately to the east of the porch. There was one on the western side as well, but this has been nearly destroyed. In a shallow niche, it instantly recalls the same thing set in the shaft of the fonts at Woodbridge and Great Glemham. Wholly religous in its symbolism, it survived a significant iconoclastic assault on this building, probably because it wasn't recognised as such. The tower is a century earlier, and the west door is flanked by delicious niches. At first sight, they are reminiscent of those at Parham and Wetheringsett, and perhaps Friston, and it is easy to assume that this was for a rood group. And yet, the central, upper niche is smaller than the others, and so the proportions don't seem right. Perhaps the upper niche contained a Madonna, and the other two St Peter and St Paul, a common grouping of the three most significant Saints in the genesis of the Catholic Church. You step inside, and, as is common in this part of Suffolk, find yourself beneath a superb 15th century roof; like Woolpit, it was extensively restored in the 19th century. The roof in the aisle must be contemporary, but seems of a finer quality - is it a different kind of wood? Someone would know. There is some decent 19th century and early 20th Century glass, although it is improved greatly by the thrill of the delicate, soaring arcade, which helps fill the church with light. Because of this, even the hatchments can't make the aisle seem gloomy, or the heavily vandalised Sulyard tomb, on which revenge seems to have been heartily wreaked by 17th century protestants. As if this wasn't enough, William Dowsing had a field day here. Dowsing, the official government visitor to the counties of Cambridgeshire and Suffolk, came this way on Monday February 5th, 1644, looking for evidence of Catholic worship. His role, which was largely self-appointed, was to strip the churches of ritualist apparatus installed under the Laudian regime of the 1630s, as well as surviving features that had been missed by the iconoclasts of a century earlier. Most parishes took this task on for themselves, but some didn't. Dowsing was particularly wary of parishes that had 'scandalous ministers' - that is to say, theological liberals - as Rectors. That late winter Monday was a particularly busy day for Dowsing. Like all good Puritans, he rested on the Sabbath, but he had planned a preliminary tour of Cambridgeshire for the following week. Trevor Cooper, the editor of the new edition of the Dowsing Journals, suggests that on this, the final day of his initial Suffolk tour, he may have carried with him some inkling of the enormity of his task. Dowsing set off from Needham Market that morning, travelling over the fields to Badley (an identical journey can be made today) and then on into Stowmarket. It must have been about lunchtime that he arrived in Wetherden, having bypassed Haughley. He must have already realised there was much to do here - the influence of the Sulyards was a strong and obstructive one. He planned to deal with Elmswell and Tostock later in the afternoon, before arriving in Bury, where he would spend the night. 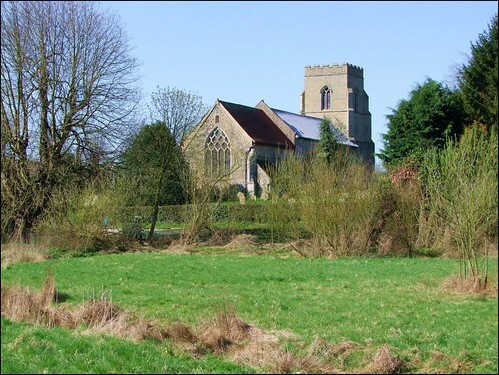 Even so, with the help of some very sympathetic churchwardens, he was also able to survey the two huge Bury churches of St Mary and St James before the day was out. In all, he would deal with eight churches this day. His tour that Monday involved a journey of some 20 miles. This is good going, on a February day when the light fades early, on horseback in the days before proper roads. In his journal, he records his activities at Wetherden: We brake 100 superstitious pictures in Sr Edward Silliard's eile; and gave order to break down 60 more; and to take down 68 cherubims; and to levell the steps in the chancell; there was takeing up 19 superstitious inscriptions, that weighed 65 pounds. So, in the space of an hour or so, St Mary underwent a thorough restructuring. It is interesting to differentiate betwen the work that Dowsing carries out himself, and that which he delegates to deputies and churchwardens. The superstitous pictures were in stained glass, in the windows; Dowsing himself destroyed all of those in the aisle, but not 60 others - perhaps these were awkward to reach, or perhaps the churchwardens asked if they could leave them until it was possible to replace them with plain glass - we'll never know. One imagines Dowsing taking a few swipes with his hammer at the monument to the hated Sulyards as he passed it, although he doesn't mention this. He also ordered the taking down of cherubims - these were the angels on the roof hammer beams, the work of several days, and something he felt safe to delegate, along with the removal of the chancel steps installed by the Laudians a decade earlier. Most interesting of all is that Dowsing suggests that he lifted all the brass inscriptions himself. These were considered superstitious, because they asked for prayers for the soul of the dead person, or said that he or she committed their soul into the hands of God - both these ideas were theologically anathema to the Puritans. It was the words cuius anime proptietur Deus on the monument that goaded the exasperated Dowsing. Nineteen inscriptions is a lot, and in general Dowsing was careful not to damage the images of the dead people themselves, or any heraldic devices or decorations - indeed, he often fond it necessary only to remove or deface the part of the inscription that suggested Catholic belief. So what happened here? Today, only one brass survives, set in the chancel. It is likely in any case that many Suffolk brasses were actually stolen or destroyed in the 18th and 19th century by collectors, vandals and thieves, and that may have been what happened here. Still, 65 pounds of brass seems an awful lot. Clearly, the only reason for weighing it is if it was going to be melted down, which sounds shocking, but isn't really - the Puritans were pragmatists, and the money they raised for the parishes was given back to them to be used for essential maintenance and charitable works (unlike the theft perpetrated under Henry VIII and Edward VI a century earlier). Perhaps the brasses had already been lifted and weighed by enthusiastic parishioners before Dowsing's visit, and he is merely recording here the official detail. Again, we shall never know. But the real joy of St Mary is its bench ends. Some are 15th century, some are excellent 19th century replicas. In quality, the medieval work ranks with neighbouring Tostock and Woolpit, although I'm not entirely convinced that it came from the same workshop. My favourite is the gorgeous Victorian wolf - at least, I don't think it is a bear. The charm of the later work is that it is not particularly exact - this isn't the work of Henry Ringham, for example, but of some local jobbing carpenter. I'm also fond of the squirrel that tucks into an acorn, its tail tucked neatly behind its back. Some of them are ambiguous - what appears to be a medieval horse licking its haunches is in fact a unicorn, its horn now missing, but scratching its backside like those at Honington and Ixworth Thorpe. A dog looks on in wonder. Quite a few of the creatures are eating; a dog carries a duck, as at Woolpit and Tostock. One of the 19th century ones is probably an owl, but might be a buzzard, and has a tiny shrew in its beak. Why are they here? There are many theories, and I discuss this at some length on the entry for Woolpit. You step back outside into a splendid churchyard, full of 18th and 19th century memorials, and sloping suddenly down towards the east - lots to explore. So there you are, then; this little known church is a box of delights, and not too far off the beaten track. I recommend it to your attention.